Just recycling? Apple did not even hold a keynote for its latest tablet model. All we got was a press release. We think: That is enough for the Apple iPad (2017), because it is a very good tablet – and finally for a fair price. We've heard this described as the iPad: Education Edition; you might also think of it as the iPhone 5c of Apple's tablet range. However you put it, this is an unexpectedly cheap offering, but one that is also generally low-specced and has a design that's mostly lifted from a product that's two and a half years old, and in some cases from one that's three and a half years old. It's all rather odd. It may sound like we’re a bit down on the new iPad, but that’s only because its improvements aren’t the flashy kind. It’s exactly what we liked about the iPad before, but cheaper and faster, and comes with 32GB of storage as standard. Overall, the 2017 iPad is a very solid tablet that ticks all the right boxes. It has a nice and crisp Retina display, solid build quality, the iconic iPad Air 1 design and truly superb battery life. In fact, it is one of the few devices whose battery life outstrips the manufacturers estimates. The iPad 9.7-inch is the perfect mix of features and price. It doesn’t offer up anything new, and I think the iPad Air 2 is still the better tablet, but for everyone else looking for a reliable device then this ticks all the boxes. 90% New iPad review: faster, longer lasting and with more storage. What's not to like? Broadly speaking, the new iPad is a worthy update to Apple's tablet line an d a long overdue, if not groundbreaking, replacement for the iPad Pro. If you’re looking for a new tablet, then you should give the iPad a lot of consideration. Don’t replace your iPad Air with one. If you have an iPad older than that, you will want to look into upgrading. It doesn’t work with the Apple Pencil or Smart Cover, both designed only for the iPad Pro. However, you can find a wealth of great accessories to use with the 2017 iPad thanks to iPad line’s popularity. The 2017 iPad isn't Apple’s usual big upgrade. Instead, it’s aimed at owners of older iPads who want better performance and the latest software features. It’s slightly disappointing that the screen isn't laminated and that the cameras aren't the best Apple offers in an iPad, but considering the price it’s good value overall. On the surface, it seems like the 2017 Apple iPad represents a mild upgrade to a now-commoditized slate. It doesn't make a strong case for an iPad Air 2 owner to rush out and buy a new model. But owners of aging iPads, starting with the original iPad Air and looking back from there, will see noticeable performance gains, particularly on battery life, audio, and the snappiness of the navigation. I can say that those who are still holding on to an older iPad, many of which are too old to run iOS 10, as well as those who have never owned an iPad due to the entry cost, there's no better tablet you can buy for $329. This iPad is great for families, schools, businesses looking for a point-of-sale system, and just anyone who wants a workhorse of an iPad without the bells and whistles of the more expensive iPad Pro. It’s everything great about the iPad at a lower cost to entry than ever, and if your kids are as nuts about the iPad as mine is, this is the one to get them. The new iPad may not be the most innovative product Apple has ever created, but it's an upgrade on the iPad Air 2 and the new version makes for a fantastic option at an even lower price than iPads of years past. This new iPad offers a solid, consistent tablet experience at the lowest price we’ve seen from Apple in a new, full-size tablet. The iPad combines long endurance, a fantastic screen and strong performance in the best tablet value on the market. The iPad (that's just "iPad" – no suffixes or qualifiers) is available now, starting at $329 for a 32 GB Wi-Fi only model. You can also upgrade to a Wi-Fi + LTE device, or the 129 GB storage tier. Color options are silver, gold and space gray. We've heard this described as the iPad: Education Edition; you might also think of it as the iPhone 5c of Apple's tablet range. However you put it, this is an unexpectedly cheap offering, but one that is also frequently low-specced and has a design that's mostly lifted from a product that's two and a half years old, and in some cases from one that's three and a half years old. It's all rather odd. I’m left seriously consider whether I could get one of these as a second iPad, leaving my 12.9in Pro as my workhorse machine. And if I’m left thinking that, I suspect a lot of people who have older iPads or even those who felt like they had to move to Android because of price will feel the same way. Apple’s newest iPad is a budget model that samples the best parts from past hits. We’ve got the original iPad Air’s body stuffed with the iPhone 6s’s A9 chipset and paired with a brighter version of the iPad Air 2’s display. We have no complaints about performance, and battery life is excellent. But, Apple’s compromises are evident in the tablet’s relative thickness and the glare-prone screen. What the iPad lacks in sheer thrills, it more than makes up for with adequate power and a price that’s hard to resist. But really, don't let the stuff you hear out there in Apple Land bother you. Investors and tech writers are wondering what Apple is Going To Do now that we know that nobody upgrades their iPads to new models every couple years. In the real world, people just use their iPads until they don't work and then they get new iPads. And what Apple is Going To Do is what it just did: just make a good iPad and sell it at a reasonable price. As an iPad Pro user, I was fully expecting to be disappointed by this model. Yes, there are some obvious compromises, but you’re getting an iPad that's only bettered by the much more expensive Pro series, at a price Apple has never reached before. If you're in the market for a tablet, it's wise to consider Apple and its popular iPad brand. The problem is that Apple has quite a number of iPads to choose from. To make things easier for the buyer, here is a compilation of the features and other details of some of the more popular of the current crop of iPad devices. We've heard this described as the iPad: Education Edition; you might also think of it as the iPhone 5c of Apple's tablet range. However you put it, this is an unexpectedly cheap but also disappointingly underspecced iPad for the average tablet buyer. Look own the specs list: on almost every count it's worse than the (year-old, although admittedly still very expensive) iPad Pro 9.7-inch, including being mysteriously thicker and heavier despite not apparently fitting in any additional componentry. Perhaps the battery unit is bigger. Apple iPad 9.7-inch (2017): Is It Good for Business? If Wi-Fi isn't an option everywhere you need to take your iPad to work, you can opt for 32GB Wi-Fi plus cellular options starting at $459. Would that LTE coverage be enough to make this your favorite work tablet? Perhaps. What's undoubtable is that this lower-cost model of an Apple full-size tablet means the company hopes you'll make the switch. Wie gut ist das günstigste iPad? Recensione iPad 2017 32GB Cellular: che rivoluzione! Positive: Nice design; good hardware; decent performance; solid workmanship. Positive: Solid workmanship; high autonomy. Negative: High price; slow charge. Positive: Good display; solid workmanship; long battery life; fast system. Positive: High autonomy; excellent cameras; good price. Negative: Slow charge. Đánh giá iPad 9.7 inch (2017): Liệu có đáng mua? Positive: Good price; decent hardware; nice performance. Negative: No Apple Pencil. Positive: Decent hardware; nice design. Apple's iPads typically offer high quality at hefty prices, but the company's latest tablet flips the script. The latest Apple iPad 2017 packs a speedy processor, vibrant display and phenomenal battery life at a slightly lower price tag. 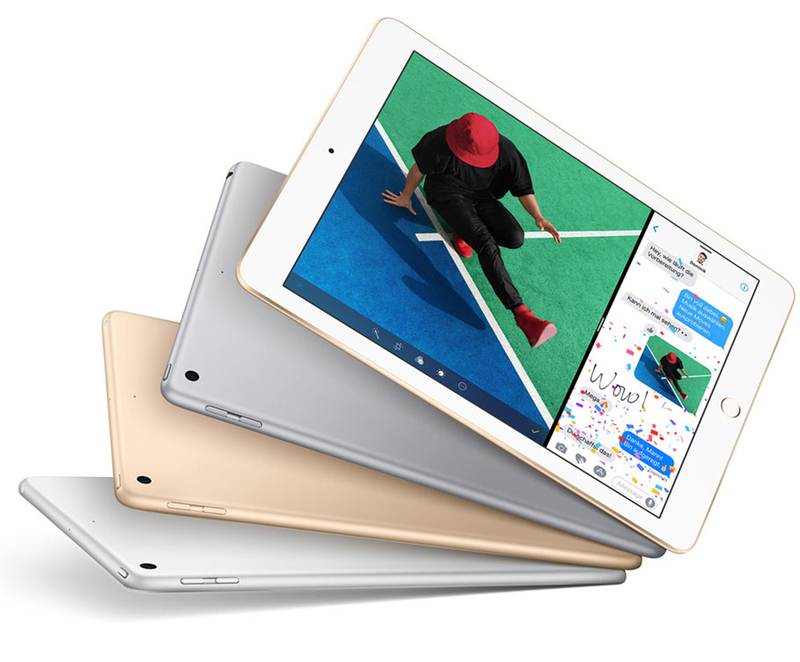 This iPad effectively replaced 2014's premium iPad Air 2 as the best full-size, non-Pro tablet in the company's lineup. However, Apple wanted to keep these basic models distinct from more premium iPads, so there are no Smart Connector pins on the iPad's left side, nor a laminated display. Weighing 16.5 ounces and measuring 0.29 inches thick, this iPad is by a hair heavier and thicker than some competitors. The iPad also a little thicker than the Air 2, at 7.5mm to the 6.1mm of its waif-like predecessor. This suggests a little bit of cost-cutting to get the price down, but it's a marginal difference. The iPad's two-tone aluminium unibody still looks sleek, though it won't wow anyone who is familiar with the past years of Apple design, as it is available in the same silver, gold and space grey colour options. The home button on the iPad features an actual clickable button, as well as Touch ID. Stereo speakers sit on the bottom edge of the tablet, while the buttons for power and volume are in the upper right corner. As is the case with all non-Pro iPads, this machine's only ports are its lightning port and headphone jack. As for battery life, it features 10 hours of surfing the web or watching video on Wi-Fi. The iPad comes pre-loaded with iOS 10.3. The iPad's 2048 x 1536-pixel panel offers bright, vivid colour and fine details. Emitting 470 nits (a measure of brightness), the iPad's display is amazingly bright. That means the panel outshines the iPad Pro 9.7-inch (432 nits) and 374-nit category average. With that brightness, the iPad offers excellent viewing angles, avoiding colour darkening even at 75 degrees to the left and right. However, the iPad's screen doesn't offer fingerprint resistance or anti-glare coating. Under the hood, the A9 processor in the iPad provides excellent multitasking performance. 2GB of RAM also allows for comfortable web browsing and app use. The iPad benefits from the multitasking view modes that Apple introduced in iOS 9. That means a user can slide a second app in from the right side of the screen, split the screen between two apps and watch a video in Picture-in-Picture mode. The iPad's cameras shoot rich and accurate photos and videos. It has a rear-mounted 8-megapixel camera and a front-facing 1.2-MP FaceTime HD camera. Both of the iPad's cameras take Live Photos, Apple's GIF-like tap-to-animate snapshots. The tablet's rear camera also records sharp, accurate 1080p videos. In a perfect world, the 2017 iPad would be a total upgrade over the previous versions, much like the iPhone 8 is expected to be. But it isn't. While the entire gadget world has been moving at an unprecedented speed, Apple's iPad has remained pretty much the same since it was first introduced. This is also due to the declining interest in tablets. 84.89%: This rating should be considered to be average. This is because the proportion of notebooks which have a higher rating is approximately equal to the proportion which have a lower rating.